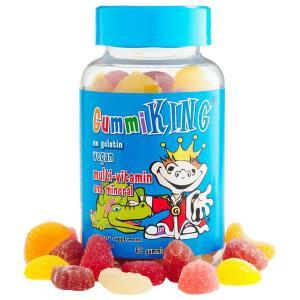 Gummi King Multi-Vitamin & Mineral gummies come in six natural fruit flavours (strawberry, lemon, orange, grape, cherry & grapefruit). They are vegan and gelatin free, and provide kids with multi-vitamin & minerals, key vitamins they need during their growing years. Free of: gelatin, wheat (gluten), milk, eggs, soy, tree nuts, peanuts, artificial flavours, animal derivatives and preservatives.